I’m crazy about our giant new sandbox. Yesterday morning I went a spin class for the first time in about a decade. I survived, and am very happy to report that I made it all the way through the class, kept up with the instructor’s instructions and most importantly I didn’t barf during (or after) the class. 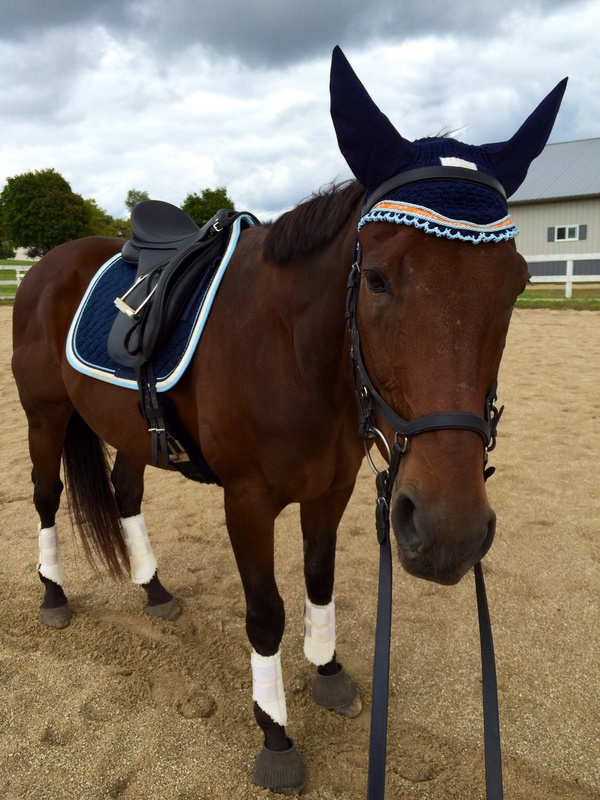 So, yay me, but I won’t kid you – the class fried my legs, and left my hips really really tight, so I wasn’t sure how much work I was going to able to do in the saddle when I went to the barn last night. So I tacked up Derby and went for a long walk, taking a “wait and see” approach. We walked and walked, flexing left and right, doing a little shoulder in here and there, and throwing in some little leg yields. 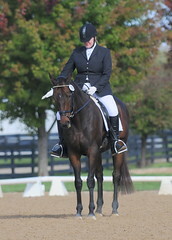 Eventually I started to really work on his responsiveness to my leg, and we wound up doing quite a bit of lateral work. Derby started to really come into my hand, stretched nicely over his top line. I think it felt good to both of us, as in addition to stretching into the contact, he was staying there and lifting his back. 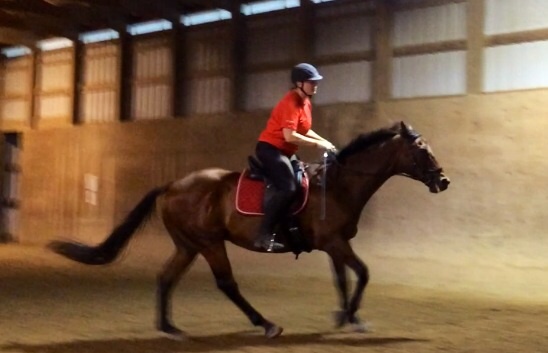 I was simply enjoying how the walking motion of the horse opens up tight hip flexors and warms up fatigued legs. After a while, I started to feel kind of decent. After a good 15 to 20 minutes of walk work, I finally decided to go ahead and get a little trot work and try and as expected, my legs were like jelly, and it was clear I was not going to last long at all. 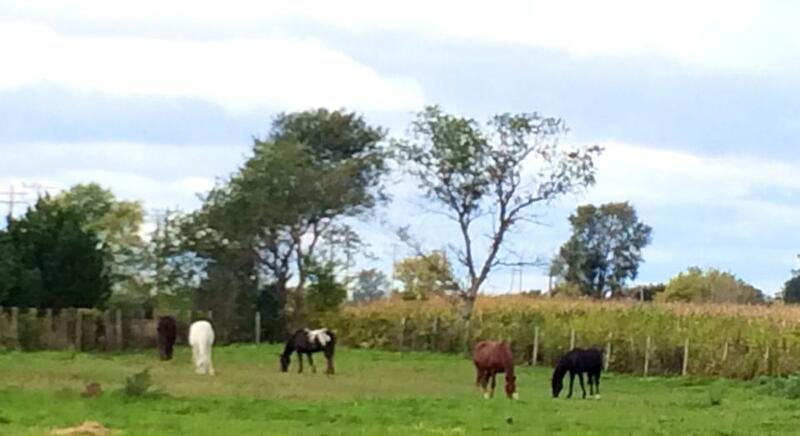 That said, the trot work I got was just lovely – Derby was round, maneuverable and on the aids. It was another reminder to me that I need to spend more time really doing deliberate warm-up, using that time to train rather than just walking around and getting us both loosened up. I can still achieve that objective while using the time much more productively to test into my buttons and get Derby really working over his back and responding to my aids. I’m not that into New Year’s resolutions – I think they’re kind of silly and as I think most of us know, they don’t stick. However, I feel pretty good about resolving to incorporate longer and more productive warm-up time in my rides. 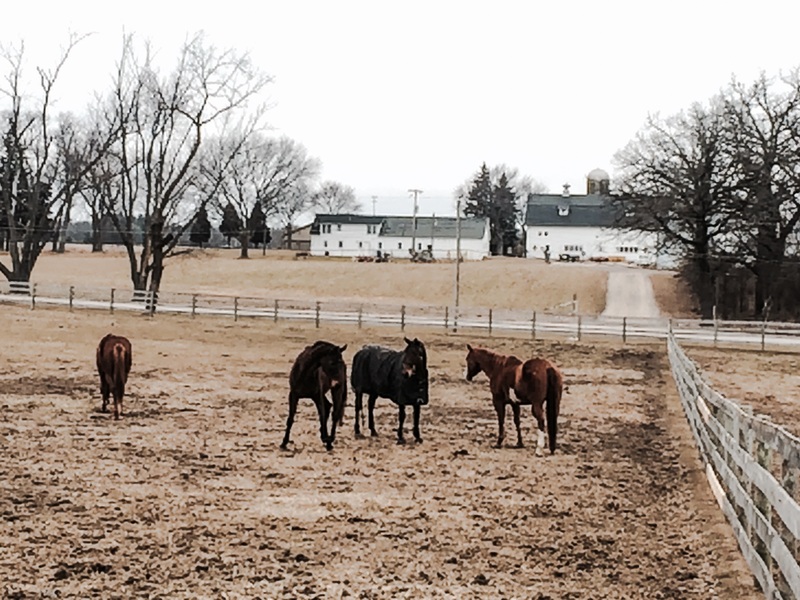 Derby meets his new herd. 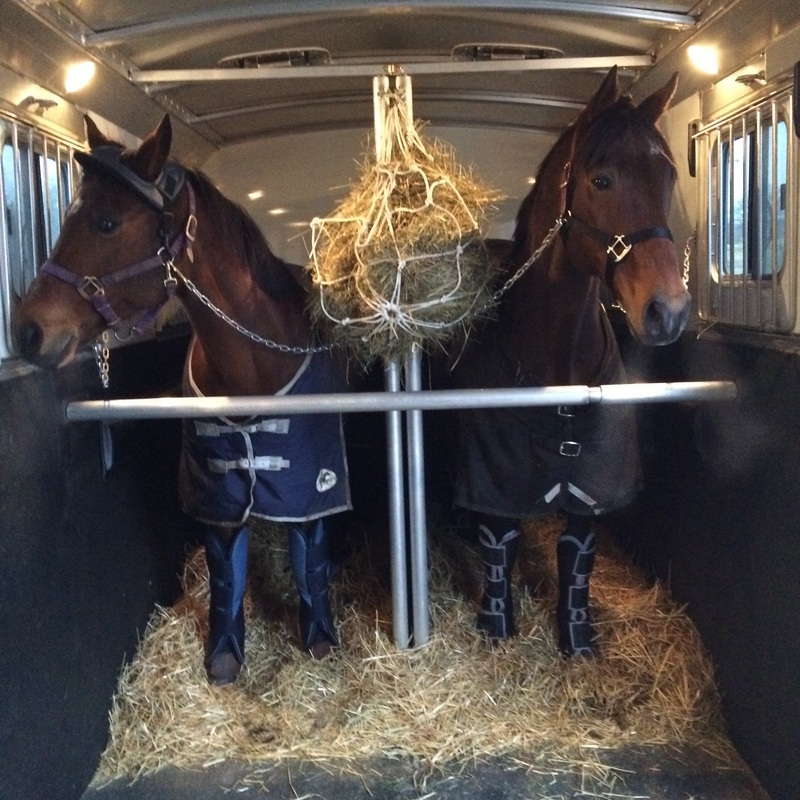 Boomer and Derby eb route to their third barn in one month. Good boys! 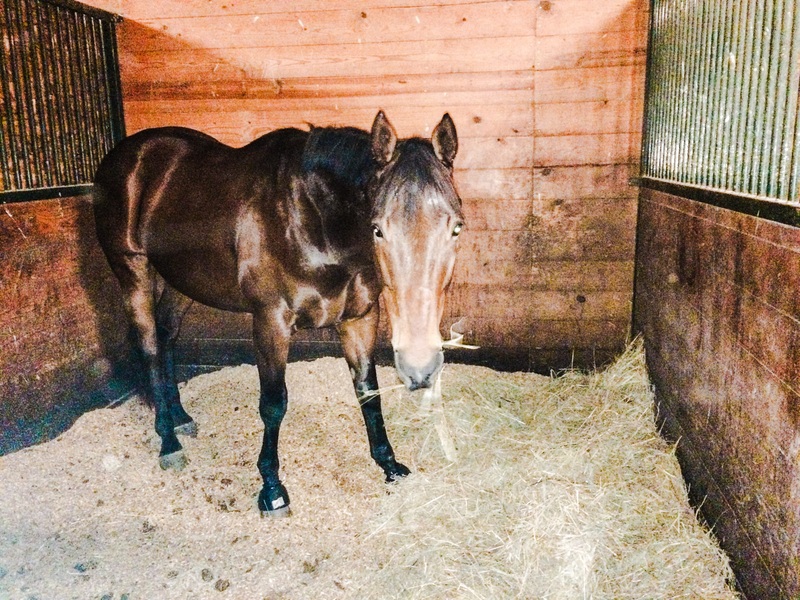 It’s been an eventful month – I’ve moved to Derby two different times this month, after the care at Silver Fern Stables really took a nosedive. Unfortunately, the second place turned out to be a dud, but the third barn has definitely been the charm. His new room has a view. It’s a significant upgrade for Derby, with much larger stalls, really good turnout and, most importantly, generous amounts of quality feed. He’s already gaining weight and his entire demeanor suggests that he’s happier and feeling good. 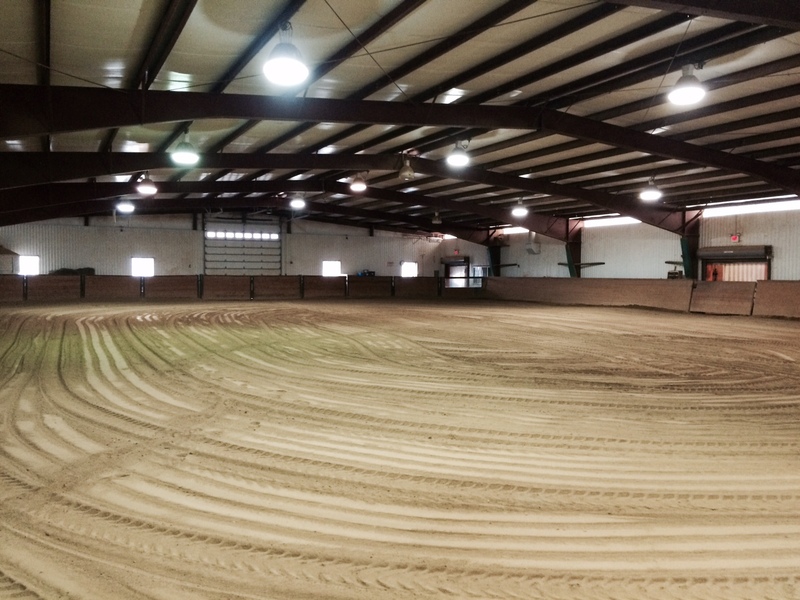 The new barn is also a bit of an upgrade for me, too – the barn is heated! Let the winter winds howl – I am not going to be freezing my tailfeathers off again this year. Creature comforts aside, it’s been more than a month since I had a lesson with Christy, however, she will be training at the new barn so we will be picking up where we left off very soon. In the meantime, I’ve had some good practice riding in Derby in new environments, and I think that we passed with flying colors. Barn number two was a small operation with a quiet, enclosed arena. It posed little problem for Derby, and he didn’t put a foot wrong while there. Barn number three is a different story. It has the largest indoor arena I’ve ever seen, and has a couple potentially spooky areas. At one end, there’s an open space between the arena rail and the building’s exterior wall where people keep tack trunks and where hay and feed are stored. Because the barn is heated, there are also large plastic flaps on that doorway, as well as the doorway entering the arena that horses need to pass through, to prevent heat loss. I was determined to not let any of these things become a problem for Derby. I knew that from the get-go these things had to be schooled and accepted with no questions from the horse. Donna and Boomer moved with us, and on the first day, Donna and I took turns schooling the boys in the arena. While one of us lead our horse around in the arena, the other went in and out of the flappy doors, making a racket, slamming tack trunk lids and making the plastic flap. 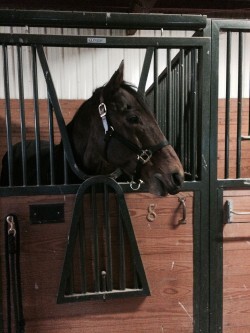 Enjoying his much larger stall. This little extra bit of schooling paid off, because both boys were on their best behavior on their maiden voyages around the big indoor. In fact, Derby has not put a foot wrong in the rides that I’ve had subsequently. 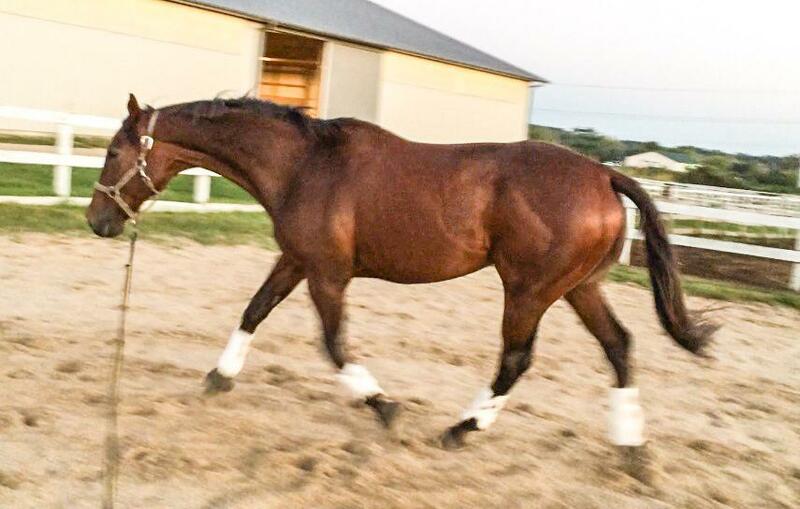 He’s working really nicely, staying quiet and focused, and moving beautifully, which is testament to his appreciation of the significantly improved footing the new barn offers. However, I’m going to take a little credit, because I’ve been giving him rides that are as good as I can muster. We’re focused in our warm ups, starting with loosening his poll and then bending, stretching and incorporating lateral work. I’m insisting that he stays responsive and on the aids. 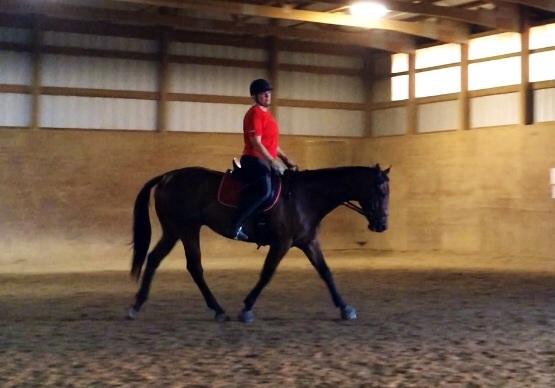 We’re working a lot of half-halts and transitions within gaits to keep his attention and to allow me to maintain control over his inside hind. Between more active riding on my part and the improved footing, we’re getting some very nice work – he’s through and into the bridle, working nicely over his back. We’ve even been able to produce (and maintain) some lovely connected stretchy trot, for which I was rewarded with flecks of foam around his bit. We even earned a compliment from one of the other trainers who gives lessons there, which was really nice to hear. All in all, I’m thrilled with the move and how we’re both handling it. We’ll get going again with lessons soon. Stay tuned! Last winter, prior to his surgery, I barely rode Derby. Our November and December weather here in northern IL is typically marked by wild temperature swings, and he was tough for me to handle. He was spooky and reactive, teleporting across the arena when a door opened and spooking at invisible gremlins. I loaded him him up with calming supplements, swaddled him in quarter sheets, and muddled my way through the coldest months. We did a lot of ground work. That’s no way to live. Fast forward twelve months, to this week. 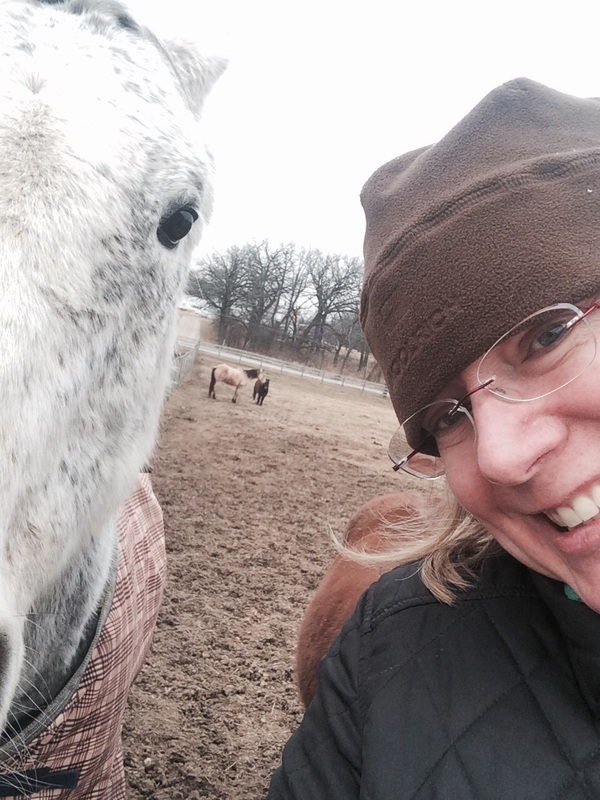 The temperatures have been crazy – on Wednesday night, it was 55 degrees, and Derby got a bath after our lesson. Two days later, the lows were hovering near zero. And we’ve been riding through it all, and it’s been great. What’s the difference? My riding, pure and simple. The frustrating months spent battling my knee and rebuilding my everything appear to have paid off. I’m keeping Derby connected and through, working over his back and one the aids. I can’t begin to describe the monumental change this made in my ability to keep Derby focused. His behavior has been stellar. And I can put him on the bit right from the get go, and for the most part, I’m keeping him there. 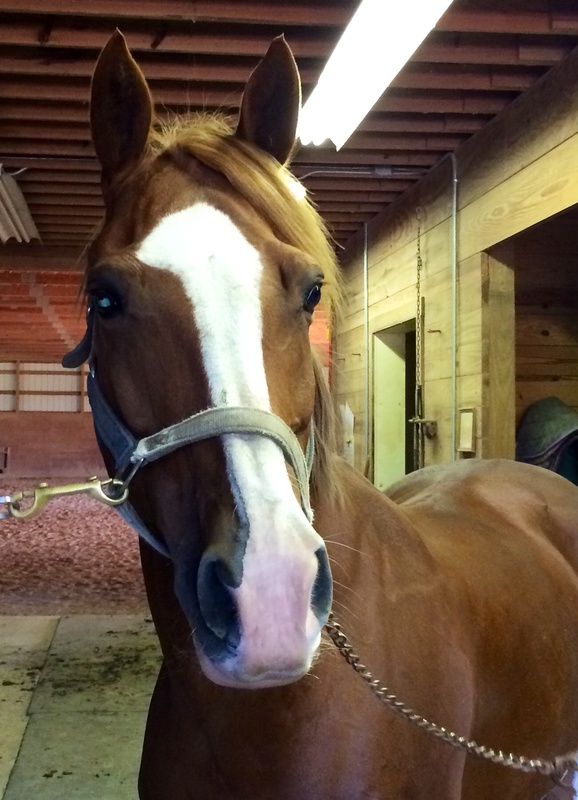 On Thursday, we rode through an old intro test, and I was astounded at how well it rode. Christy commented that it better than she’d ever see us look. All of this gives me hope, because I know unequivocally that I wasn’t riding him well last winter, and at shows where we had problems. He wasn’t on the aids and connected. He was able to spook and evade and be ridiculous, because I allowed him to do so. I’m learning to manage the ride, from start to finish. Today we had another breakthrough. It was cold – really cold. As in about 15 degrees. While I have not been giving Derby calming supps this year, I do use a quarter sheet (and a Back on Track pad) on very cold days. So I did. Like Linus giving up his security blanket, I was a bit trepidatious as I took the sheet off, but thought “What the hell,” and went back into the arena. Anything is better than fighting a horse that is behind your leg . At the first sign of balking, Derby got a crack with the whip, and he gave the right answer, snapping to attention and getting to task. The second half of our ride was really nice, and we had good energy. I closed out the ride working on my left leg, which is still persistently unsteady. It just needs to get stronger, and it is, but not fast enough for my tastes, which is why I’m starting private Pilates lessons next week, and am looking into Feldenkrais work too. We’re going to have a great winter!